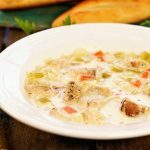 Lemon Chicken Orzo Soup is a healthy, fresh soup bursting with bright lemony flavor! It is full of vegetables, tender orzo pasta and hearty chunks of chicken. This is pure comfort food that is easy to make and everyone will want seconds! In a large stockpot heat the olive oil over medium heat. Add the onion, carrots, celery - season with salt, pepper (red & black) and add the bay leaf. Sauté until just tender, about 5 minutes. Next, add the garlic and saute until fragrant, about a minute. Add the lemon juice, zest, chicken stock. Bring to a boil & add the orzo. Cook uncovered, stirring often - this will release the starch in the soup and help thicken it. It will also keep the orzo from sticking to the bottom of the pan. Cook until the orzo is just al dente - depending on the brand 6-9 minutes. Remove from heat and add the chicken, parmesan cheese and cream. Heat thru. Remove the bay leaf & adjust seasonings if necessary (may need a bit more salt & pepper). It's ready to serve! * If you like a really thick stew rather than soup, increase the amount of pasta to 1/2 cup.